Ah, buffet! The very thought of it is enough to warm every foodie’s heart. Aside from literally being able to eat all you can, you get to choose from a wide variety of dishes, cuisines, desserts, and drinks. Whether you’re one for steamboat sessions or Western staples, there is a halal buffet to suit your taste and cravings. There’s a growing number of buffet restaurants that cater to our Muslim brothers and sisters. 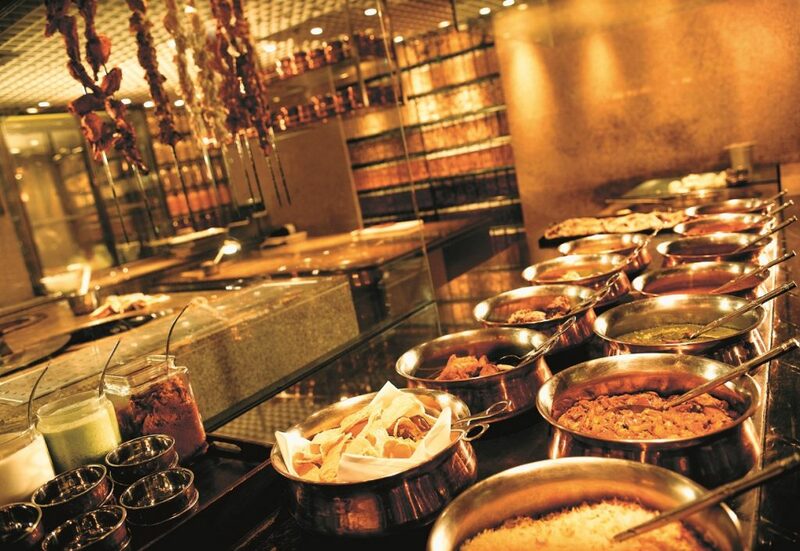 Take your pick from this list of places with amazing halal buffets in Singapore! Themed restaurants add more flair to the dining experience and we can’t get enough of them! One must-visit spot is 21 on Rajah in Days Hotel, whose halal dishes are bursting with Mediterranean and local flavours. 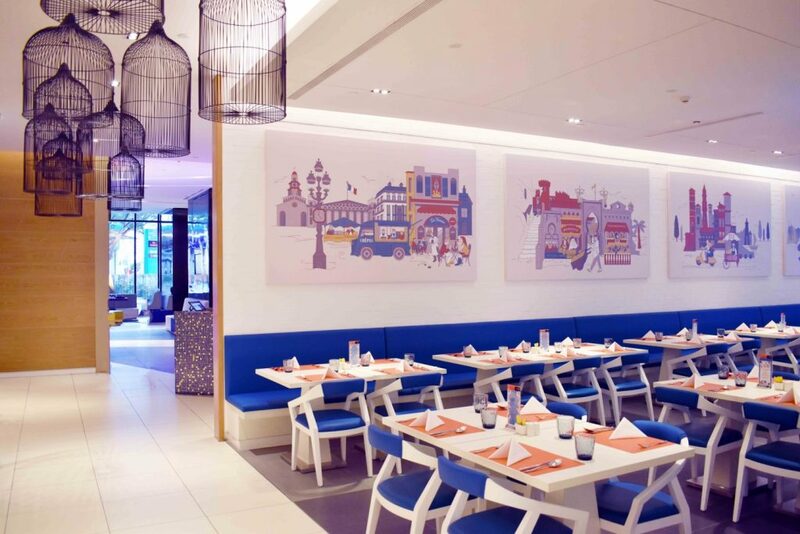 Indeed, 21 on Rajah’s white and blue interiors make you feel like you’re dining in Greece. Enjoy a savoury fusion with the Mediterr-Asian “Pasar” street market dinner buffet or the Indonesian rijstaffel weekday lunch buffet. Wow, that’s a complete gastronomic journey from West to East! Miss Tam Chiak encourages foodies to try 21 on Rajah’s signature New Zealand prime beef rib-eye with signature homemade sauces, the churros station, and, from the weekday lunch buffet, roasted lamb leg with Arabic spices. Rates are from S$15 to S$22.50 for children five to 12 years of age and S$30 to S$45 for adults. Children aged four and below dine free with a paying adult. Call +65 6808 6847 to book a table. 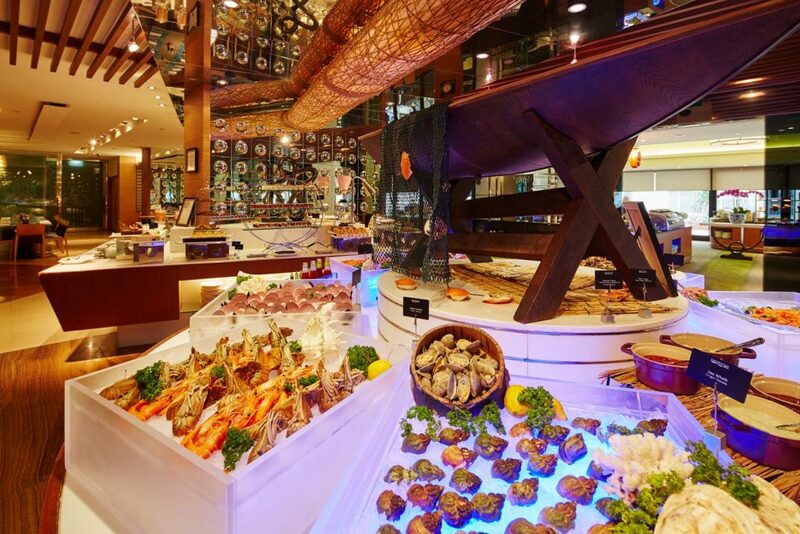 Located on the fourth level of the Marina Mandarin Singapore, AquaMarine is an impressive seafood paradise. 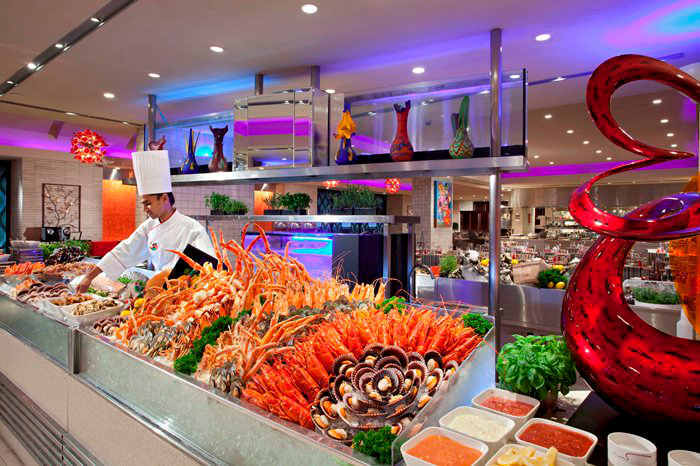 Its halal buffet spread features Asian and international cuisines, as well as the signature Jumbo Laksa. As a hotel buffet restaurant, AquaMarine boasts of spacious and sophisticated interiors. It is also lauded for its unparalleled staff hospitality. Lunch rates are S$60 for adults and S$30 for children aged six to 12 years old. Dinner rates are at S$70 to S$80 for adults and S$35 to S$45 for children. For weekend lunch, every child below 12 years old can dine for free with every paying adult. Call +65 6845 1111 or email aquamarine.marina@meritushotels.com to enquire or or make reservations. Visit the Asian Market Café on the second level of the Fairmont Hotel. The hotel buffet restaurant offers halal-certified pan-Asian cuisine, mostly from the Chinese, Malay, Indian, and Japanese cultures. 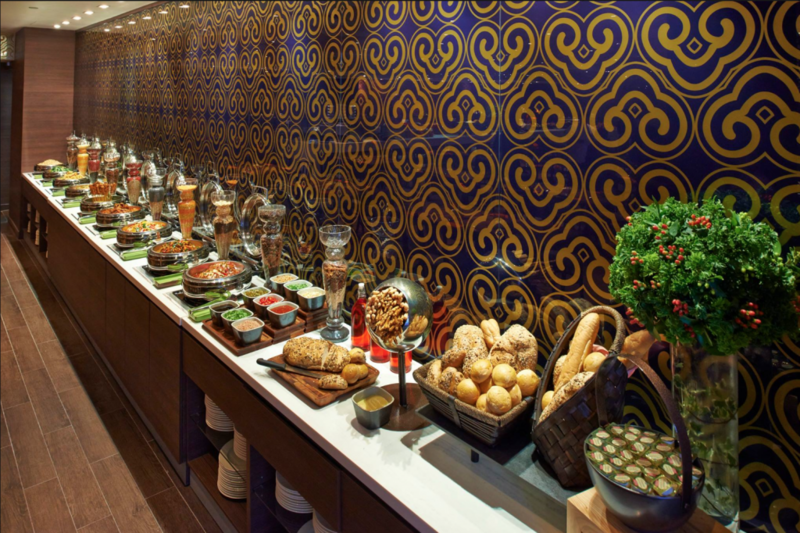 The blog, The Best Singapore, describes it as one of the most well-known halal buffet restaurants around. 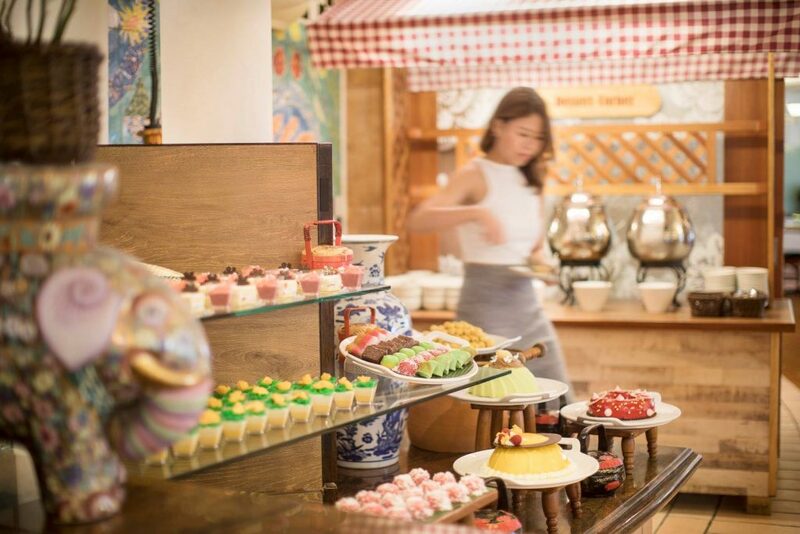 According to the blog, the must-haves in this halal buffet restaurant are the cold seafood dishes (oysters, crayfish, mussels—yum), chili crab, and delectable desserts like the Portuguese egg tart. So, reserve your slots online, dress casually, and eat for S$48 to S$65 for adults and S$26 to S$33 for children aged six to 12 years old. We’re sure you’ve imagined it, too—a city where you can eat all you can is THE dream. Buffet City comes close with its reasonable pricing. What makes it more interesting, however, is their out-of-the-box approach on halal-certified food with creative Asian fusions (nasi lemak sushi, anyone?) that introduce your taste buds to new ways of enjoying your favourites. Buffet City is in Tanjong Pagar Community Centre on 101 Cantonment Road. Lunch is priced at S$26.80 to S$27.80 and dinner at S$27.80 to S$29.80. If you’re in it for a celebration, make every dollar count at the award-winning Carousel. It was hailed as the Best Buffet Restaurant in Singapore at AsiaOne People’s Choice Awards for seven consecutive years. To date, it is also the only restaurant inducted into their Hall of Fame. What makes it so special? 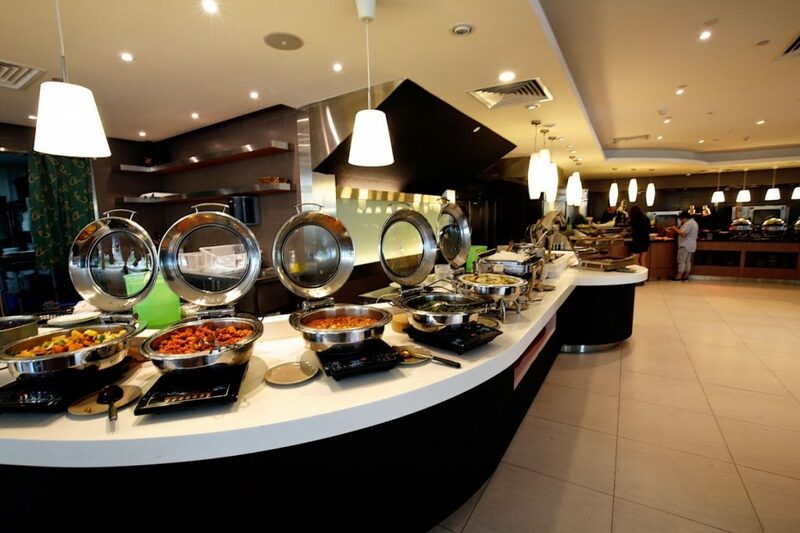 The halal buffet restaurant ticks all the qualifications of an excellent restaurant—from the delicious food, delightful ambiance, to exceptional customer service. Indulge in all the Japanese sushi variants you can think of, Mediterranean-style cooked crustaceans, delectable Asian and Indian delicacies, and desserts that are to die for. The dining experience is guaranteed to be fulfilling! Meals range from S$32 to S$83 for adults and S$20 to S$49 for children aged four to 11 years old. Carousel is located at the lobby level of Royal Plaza on Scotts. Call +65 6589 7814 to reserve. Katong Kitchen, which is located on the fourth level of Village Hotel Katong, is one of the must-visit spots in the eastern district of Singapore. The halal restaurant takes pride in its Peranakan cuisine, but also serves Macanese, Asian, local Chinese, and Western dishes. From the Peranakan spread, try the Ayam Buah Keluak, Kueh Pie Tee, and Katong Laksa, among many other sumptuous dishes that will keep you coming back. Apart from the food, fans of Katong Kitchen also love its Asian-themed interiors adorned with Peranakan artifacts. Have lunch for S$38 to S$48 for adults and S$19 to S$24 for children aged six to 12 years old. Dinner is at S$48 to S$58 for adults and S$24 to S$29 for children aged six to 13 years old. They offer a great deal for seniors, too—with 50% off their buffet meals! Reserve your seats through their Facebook page or call +65 6551 2141. Another halal-certified restaurant that has gotten multiple awards is Kintamani Indonesian Restaurant in Furama RiverFront. 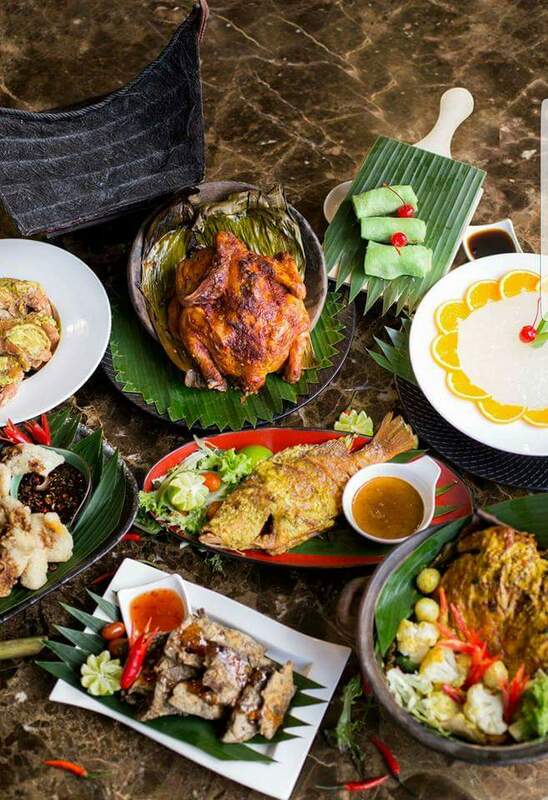 You can enjoy authentic Balinese, modern Indonesian, and other variations of traditional Asian cuisine. Many online reviews have praised the restaurant for buffet offerings such as huge boiled prawns, beef rendang, an assortment of kue kue, and many more. Be sure to wear loose pants and comfortable shoes so you can easily make your way from your table to the buffet station and back as many times as you wish. Lunch and dinner are priced at S$58 for adults and S$20 for kids. Call +65 6333 8898 to enquire. Tired from being an office zombie? Head out to Kublai Khan Mongolian BBQ and eat like hero. Kublai Khan’s motto says it all: “One Price, Ultimate Enjoyment, Great Scenery.” Best of all, it’s halal-certified. The restaurant is located on the second floor of Clarke Quay Central, providing an awesome view of the Singapore river to calm you down after the week’s tough grind. Their lunch menu includes local cuisine, garden fresh salad, local desserts, and fruits. For dinner, they serve Japanese, Western, and Chinese cuisines, as well as fresh seafood. You shouldn’t miss Kublai Khan’s trademark halal Mongolian BBQ dishes, which are prepared right in front of you by chefs who have mastered the unique culinary technique. Rates are from S$12 to S$17.80 for children and S$18 to S$30.80 for adults. Senior citizens and students get discounts, and babies eat for free! Call +65 6334 4888 to reserve. Sometimes, your heart longs for a buffet but your wallet isn’t cooperating. Good news! 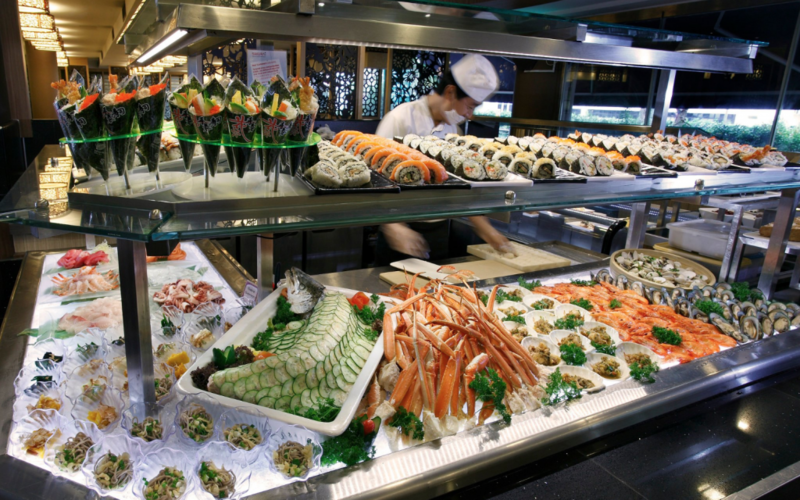 Sakura International Buffet Restaurant gives a premium on affordability without sacrificing taste and variety, what with over 150 food items to choose from. 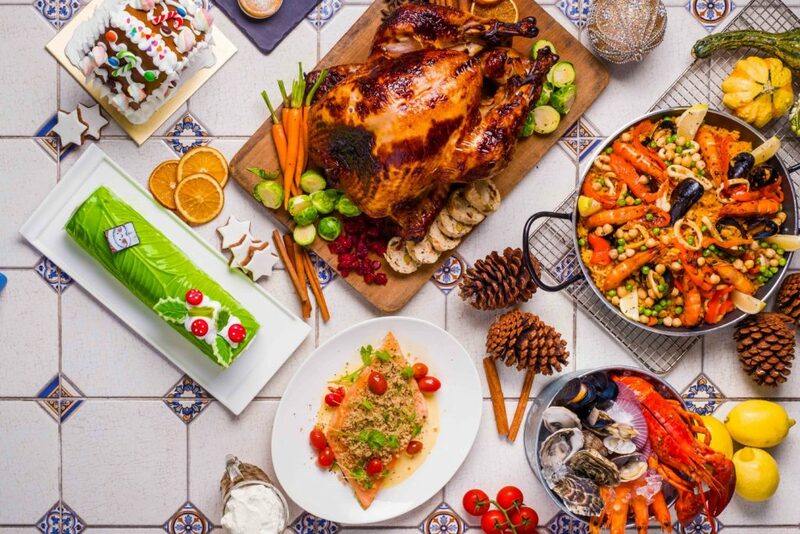 The halal-certified buffet must-haves include selections from the sashimi station, Portuguese bird nest egg tart (only in Yio Chu Kang Stadium and Clementi Woods Park branches), Hiroshima oyster omelette, Belgian chocolate Haagen-Dazs with chocolate lava cake, and more. Adults can eat from S$22 to S$38; kids below 12 years old (or shorter than 1.4 m) can dine for S$14.90 to S$16.90. Senior citizens aged 60 and above get discounts, too. You can find a Sakura International Buffet Restaurant at Admiralty Park, Clementi Woods Park, SAFRA Jurong Club, SAFRA Tampines, and Yio Chu Kang Stadium. They also offer catering services with Sakura Forte. Say you have a friend from abroad whom you’d like to impress with the local fare. Head to this restaurant, because it features noteworthy dishes Singapore has to offer. Situated at the lobby level of the Grand Hyatt, StraitsKitchen highlights Singapore cultures—Chinese, Indian, Malay, and Peranakan. Roti prata, beef rendang, chili crab, otak-otak, min jiang kueh—surely, you and your friend will enjoy this local gastronomical experience. If you want one of the most delicious laksa bowls around, StraitsKitchen’s renowned chefs can prepare a special one for you with the ingredients of your choice. Adults can dine at S$55 to S$66 and children seven to 12 years old at S$29 to S$36. Remember to dress smart casual when visiting StraitsKitchen. Call +65 6738 1234 for reservations. Of course, you can also bring the party home and come up with your own halal buffet. Make it one for the books by customising your menu according to your guests’ favourites and enjoy a multicultural gastronomic affair (Need recipes? Get them here!). Giant has a wide range halal items and ingredients, so check it out and start a-cookin’! Bonus tip: While shopping for halal goodies at Giant, don’t forget to sign up for the Giant Super Savers Club for super cool deals all year ’round!